Heart Healthy Pizza By Mark Sutton is a delightful new addition to the selection of vegan cook books. The forward was written by Howard Lyman, author of Mad Cowboy and No More Bull. The thing we like best about Heart Healthy Pizza are the wonderfully different ideas for making heart healthy vegan pizza; things that we hadn't even thought of in our decades of creating healthful vegan recipes, and publishing them on our web site. There are creative pizza dough/crust recipes (many of them gluten-free), sauce recipes, non-cheese topping recipes, and delicious ways of combining them together. 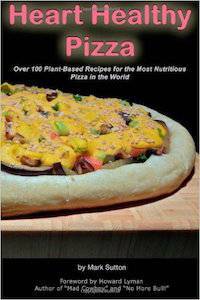 We highly recommend this 1st vegan pizza cookbook. Especially since eating pizza is very popular, it is wonderful that now a large variety of delicious, nutritious pizzas can be made so easily! Mark worked at two pizza parlors out of High School and in College, and it was there that his initial interest in making pizza began. Years later, he became vegetarian, and after watching a friend make pizzas at home for a dinner party, became refocused on learning to do the same himself in a non-restaurant environment. After going vegan, Mark began exploring making totally plant-based pizzas. During this period he came to the conclusion that a cookbook based on these recipes would help vegetarians kick the cheese habit. For several years, Mark also managed the website and newsletters for Howard Lyman: The Mad Cowboy.